I took an extended week-end trip to Seattle to visit Jeffrey and Ursula. The first and last days were primarily en route days. I stayed at McChord Field of the now-named Fort Lewis - McChord Joint Command. The facilities are quite nice and much more reasonable than a downtown Seattle hotel. The commute to Jeffrey's apartment in Seattle is "reasonable." 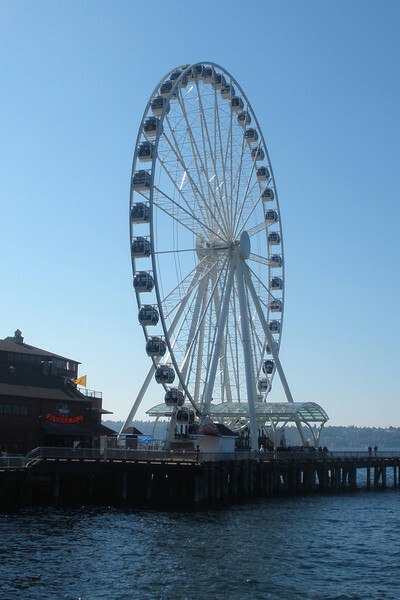 Friday was spent on a visit to downtown's famous marketplace (no pictures), followed by a stroll to check out the new ferris wheel attraction on the pier. Jeff and I then continued to the Sculpture Park, and then returned to their apartment. We chatted there for awhile, and then took a walk through the neighborhood to Volunteer Park which was a few blocks away. On Saturday they took public transportation to SEATAC where we rendevouzed and continued to the rural Tahoma Farms where there supposedly was a Corn Maze. We saw a few other corn maze attractions as we drove south with an occasional view of Mount Ranier. The farm in itself was a disappointment, but the intent is good as they primarily have organic garden produce. The drive back to Seattle on the east side, and then crossing the lake, was much less congested. A stop at the Cosco to pick up a few goods completed the afternoon. The destination for Jeff and I on Sunday was a neighborhood market, and Discovery Park. My interest in that park was that it was once the Army's Fort Lawton, and I had expressed interest in being stationed there when first commissioned. The Fort was decommissioned a short time after I entered active duty. We parked in the North Lot, and followed trails to the lighthouse area that is being restored, up the trails to some Fort Lawton buildings, and back to the car.